Let us start with a basic premise, that the Byzantine Liturgy is, in fact, eschatological. This can be seen clearly in certain basic texts. In the Anaphora of St. John Chrysostom the priest prays, “It is proper and just … to thank you, to worship you in every place of your dominion … for you … left nothing done until you brought us to heaven and gave us your kingdom to come.”1 Then, in the same anaphora, we pray, “Remembering … the second coming in glory,” and in the Anaphora of St. Basil the Great, we pray, “we also remember … His glorious and fearsome second coming.” However, the Liturgy does not dwell on imaginative and fantastic descriptions of the final coming of this future kingdom. Strangely, it is pro- claimed as if it were an event that has already happened, as indeed it has in the divine eternity. Despite this principle, the two main sections of the Orthodox Church (the Russian and the Greek) prayed in liturgical, sacred languages. The Russians worshiped in Church Slavonic, formulated in the reforms of the Moscow Patriarch Nicon (1652-1658). This text spread to all Slavophone branches of the Byzantine Church: the Serbs, the Bulgarians, the Ruthenians/Ukrainians. The Greeks faced a different problem. Their Liturgy was in koine Greek, the common Greek of the Roman Empire period. It was the language in which the New Testament was written, and a large proportion of the prayers were quotations from Scripture. How could these prayers ever be translated? It would seem to be a betrayal of the text upon which the Christian faith was established. Therefore, to this very day, the Russian Church and the Greek Church have resisted celebrating the Liturgy in the vernacular. This, however, has not been true of the Church in the diaspora. 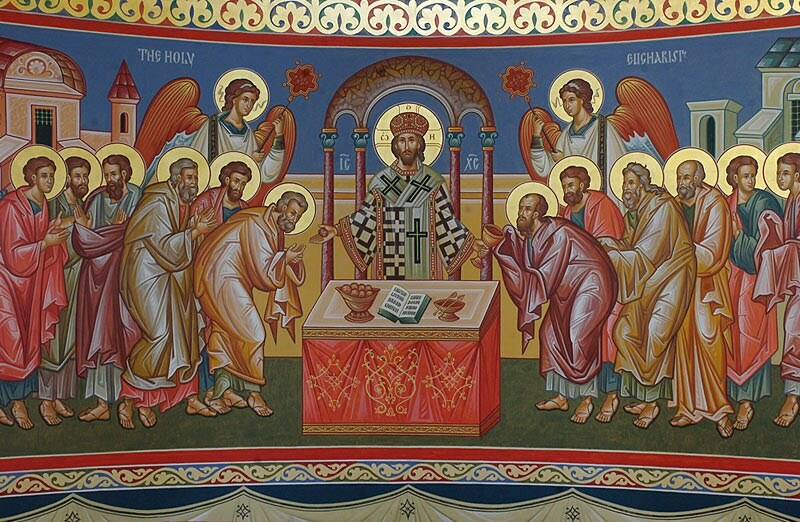 Even earlier in the Orthodox Church, but in the Eastern Catholic Churches in the United States and Canada, the Liturgy began to be celebrated in English in the late 1940s and early 1950s, before Vatican Council II. At the time people did not yet realize what a difference this would make in our perceptions of the Liturgy. In this article, then, we can talk about the liturgical text and how it manifests the eschatological nature of the Church. In the older tradition, however, words were not a source of eschatological awareness. The people perceived their worship through ritual actions, through icons, incense, and especially through the strains of chant. For example, the eschatological expectation is actually one of the reasons the Liturgy is celebrated on Sunday and facing the East. Our Lord was expected to come again on the day after the Sabbath and from the East: “As the lightning from the east flashes to the west, so will the coming of the Son of Man be” (Matt 24:27). We are more familiar with the historical interpretation: Sunday is the day of the Lord’s resurrection, and east is the direction of sunrise, symbolic of Christ, the Light of the world. In the Byzantine congregation, then, the whole assembly, including the presiding presbyter, prays toward the East. We must then ask two questions: (1) how does the text tradition of the Liturgy teach us about the “last things,” and (2) can we have an eschatological “feeling” of the Liturgy simply through the character of its celebration? Before we can even begin to answer these questions, we must have a working definition of “eschatology.” Imaginative descriptions of a future world (of heaven, hell, and purgatory) are lacking in the Byzantine Liturgy, except in liturgies celebrated particularly for the repose of the deceased, where we pray for the repose of the departed “in a place of light, joy, and peace where there is no pain, sorrow nor mourning.” Purgatory as a place is a concept completely lacking in Orthodox theology. Here we shall concentrate on what seems to be the eschatological thrust of the Liturgy, which is the definitive establishment of the kingdom of God. How is God’s dominion over the created world brought into being? We are not describing apocalyptic events that will take place in an undetermined future. Jesus told his disciples, “But of that day or hour, no one knows, neither the angels in heaven, nor the Son, but only the Father” (Mark 13:32). This is not the subject of the Liturgy, though it is a part of the background. It is clear, therefore, that the Liturgy is eschatological in the sense of the kingdom of God. Since this kingdom does not “belong to this world,” the entrance into the Liturgy is the entrance into another world. In the world of the Liturgy eschatology is already complete in the sense of the timelessness of the Liturgy. 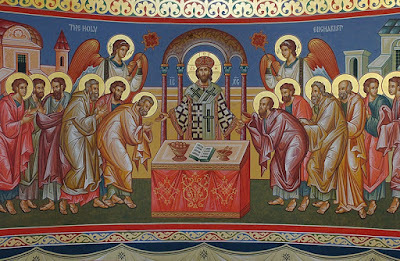 Much is made of the Cherubicon, the hymn sung in the Byzantine Divine Liturgy when the gifts of bread and wine are brought forth.6 Here the faithful chant “Let us … now set aside all earthly cares.” This has often been cited to manifest the “otherworldliness” of the service of worship, and that it is not concerned with the secular and economic concerns of the human family, nor with social justice. However, this would be a misreading. This hymn uses the vocabulary of the parable of the sower and the seed (Luke 8:4-15): “As for the seed that fell among thorns, they are the ones who have heard, but as they go along, they are choked by the anxieties [merimnan] and riches and pleasures of life, and they fail to produce mature fruit” (Luke 8:14). The warning, then, is about earthly cares that would keep us from the heavenly kingdom, not about cares for the poor and the needy in this world, which are the duty of every Christian. In the Gospel of St. Matthew, this parable is about the kingdom (Matthew 13:1-9, 18-23). If the kingdom of God is entirely voluntary, then it is also a fact that it may never be implemented by human beings in their freedom to reject the will of God. This leads to a certain eschatological tension, as God’s plan of salvation must at some point be accomplished. The Liturgy then is in some way always the fulfillment of the kingdom. Jesus told people standing about that some would not see death before the kingdom has come in its power (Mark 9:1), and his disciples that he would not eat the fruit of the vine “until the day when I drink it with you new in the kingdom of my Father” (Matt 26:29). Even if we do not freely choose the kingdom, God’s will must be accomplished in another way in spiritual power and might, according to the vision of Colossians 1:19-20: “For in him all the fullness was pleased to dwell, and through him to reconcile all things for him, making peace by the blood of his cross [through him], whether those on earth or those in heaven.” Through its timelessness, the Liturgy makes this fullness present now and impels us toward the future. In Maximus’ Mystagogia we do see some historical interpretations, but his concern is with the eschatological Liturgy. Here I mention only those comments which clearly point to the future kingdom. The first entrance with the Gospel Book symbolizes, he says, the incarnation, the entrance of Christ into this world, but also “his ascension into heaven and return to the heavenly throne are symbolically figured in the bishop’s entrance into the sanctuary and ascent to the priestly throne”(8).19 Through the readings of Scripture we learn “the laws of the divine and blessed struggles” that will win us a crown in the future kingdom (10, 199). He gives two reasons for the gospel, the first is the sense of leading to God, the second is clearly eschatological, “as if proclaiming thereby that after having preached, as it is written, ‘the Gospel of the kingdom in the whole world as a witness to all the Gentiles,’ at the end will then appear in the second coming of our great God and Savior Jesus Christ from the heavens in glory” (14, 201). Later in his commentary he sees the dismissal of the catechumens after the gospel as clearly the future judgment: “The descent of the bishop from the throne20 and the dismissal of the catechumens signifies in general the second coming from heaven of our great God and Savior Jesus Christ and the separation of sinners from the saints and the just retribution rendered to each” (24, 209). The Great Entrance with the gifts of bread and wine is “the beginning and prelude of the new teachings which will take place in the heavens concerning the plan of God” (16, 201), and then Maximus cites Jesus’ word that he will not drink of the cup of the fruit of the vine until he drinks it in the kingdom of the Father (Matt 26:29). The kiss of peace “prefigures and portrays the concord, unanimity, and identity of views which we shall all have among ourselves … at the time of the revelation of ineffable blessings to come” (17, 202). The Creed itself is the “mystical thanksgiving which perdures through all eternity” (18, 202). The Hymn of Victory (Sanctus) in the anaphora “represents the union and the equality of honor to be manifested in the future with the incorporeal and intelligent powers” (19, 202). St. Maximus passes over the rest of the anaphora. (Was this because it already had begun to be said in a low voice, or because it was the mystery which was beyond and outside of discussion?) The hymn before Communion (“One is holy”) “represents the gathering and union beyond reason and understanding which will take place between those who have been mystically and wisely initiated by God” (21, 203). In all this we see St. Maximus insisting over and over again in words of mysticism and high rhetoric that everything we do in the Divine Liturgy here and now is a prefigurement of the unity we will have with God in the future kingdom. The reception of Communion takes that prefigurement one step further to the now, for it is “the climax of everything … which transforms into itself and renders similar to the causal good [by which he means God] by grace and participation those who worthily share in it” (21, 203). St. Maximus then goes through the Liturgy three more times under different theological rubrics more oriented to the deification of the believing person. While the Liturgy already realizes our deification-union in God, there is a future to come, and St. Maximus sees in the Liturgy a call to action (“keeping the command- ments”). The mystery of the Eucharist, therefore, has an eschatological dimension. After Maximus the Liturgy did not lose this dimension, but it has become more “backward looking.” We remember an event in history — a historical fact. The result of this attitude is the paralleling of every liturgical action with an event in the life of the Lord. For primitive Christianity this was inconceivable: Why make parallels when the Lord’s death and resurrection is actually happening here and now? It happens now in a different way than what might be described as rational or unbloody or “of praise,” but it is just as real. Liturgy is not history or drama; it is God loving us today through his cross and resurrection. St. Paul’s liturgy is forward looking, to the “eschatological day when Christ would come again.” For St. Paul, the Eucharist is Jesus who died on the cross and rose, giving himself completely to us; who gives himself in the Liturgy; who is coming to fulfill all things in justice. The Liturgy is indeed the commemoration of the cross and resurrection, but the eschatological element has been badly obscured and needs a definite rediscovery, particularly in our modern technological age, which is very cosmological, seeking a glorious future in which humanity will unlock the secrets of the universe. This was Stephen Hawking’s view, that we are on the verge of knowing “the mind of God.” A Christian eschatology is also needed, that the universe will never be completely understood without its Creator (the mystery of the Trinity). The texts of the Liturgy are crucial, and with the return to the vernacular can now be better understood by the worshiping community. However, what about the traditional Liturgy from about the sixth century, when the presbyteral prayers began to be said silently, until the twentieth century? Even the traditional Liturgy, celebrated in liturgical languages and with the presbyteral prayers said in a low voice, still has the power to project an eschatological message. We remember Christ by appeals to our senses: by taste, he is the food of the messianic banquet; by the sense of smell, in the clouds of incense, “thanks be to God, who in Christ always leads us in triumph, and through us spreads the fragrance of the knowledge of him everywhere” (2 Cor 2:14); by the sense of sight, the icons of our Lord present among us now in power, particularly in the image of the Pantocrator; by the sense of hearing, in chants and hymns and readings that arouse in us faith and peace and confidence in God’s power and might. St. Maximus the Confessor specifically notes of the chants “that the spiritual enjoyment of the divine hymns signified the vivid delights of the divine blessings by moving souls [a call to action!]. Toward the clear and blessed love of God and by arousing them further to the hatred of sin” (11, 190). The Liturgy summons us into a new world, but the question remains: Is it a world only of refuge, a moment of peace and detachment from this present world to which we must return, or is it the beginning of a new creation, the inchoate “new heaven and new earth” (Rev 21:1), the beginning of a transformation “in the name of the Lord”? I suspect that for many it remains only the first, but it has the power to be the latter. Very Rev. David M. Petras is professor of liturgy and director of spiritual formation at the Byzantine Catholic Seminary in Pittsburgh, Pennsylvania. 1. All quotations from the Divine Liturgies of St. John Chrysostom and St. Basil the Great are from the official texts of the Pittsburgh Metropolia: The Divine Liturgy of Our Holy Father John Chrysostom (Pittsburgh, PA: Byzantine Seminary Press, 2006) and The Divine Liturgy of Our Holy Father Basil the Great (Pittsburgh, PA: Byzantine Seminary Press, 2006). 2. Cyril Korolevsky, Living Languages in Catholic Worship: An Historical Inquiry (London ; New York : Longmans, Green, 1957), 15. 4. Quoting Psalm 118 :126. I choose this as the title for my catechetical commentary on the Divine Liturgy, Time for the Lord to Act (Byzantine Catholic Metropolia of Pittsburgh, 2005). 5. Karl Rahner, “Eschatology” in Sacramentum Mundi 2: 244. 6. There are alternate hymns for the Presanctified Divine Liturgy and the Divine Liturgy on Holy Thursday and Holy Saturday. 7. Cf. Robert Taft, “Was the Eucharistic Anaphora Recited Secretly or Aloud? The Ancient Tradition and What Became of It” in Worship Traditions in Armenia and the Neighboring Christian East, ed. Roberta R. Ervine (Crestwood, NY: St. Vladimir’s Seminary Press, 2006), 15-57; P. Trembelas, “L’audition de l’anaphore eucharistique par le peuple,” “The Hearing of the Eucharistic Anaphora by the People,” originally in L’église et les Églises. Collectio Irénikon. Etudes et travaux sur l’Unite Chrétien offerts a Dom Lambert Beaudin (Collections de Chevetogne 1955, Vol. 2, 207-20) translated from the French in Eastern Churches Journal 8, 2 (2001), 81-96; David Petras, “The Public Recitation of the Presbyteral Prayers,” Eastern Churches Journal 8, 2 (2001), 97-106. 8. English translation of “The Church’s Mystagogy” by George C. Berthold, Maximus Confessor: Selected Writings (Classics of Western Spirituality, New York: Paulist Press, 1985), 181-225. 9. English translation: St. Germanus of Constantinople on the Divine Liturgy, trans. Paul Meyendorff (Crestwood, NY: St. Vladimir’s Seminary Press, 1984). 10. There is no English translation. For a description of the work see René Bornert, Les Commentaires byzantins de la Divine Liturgie (Paris: Institut Français d’Études Byzantines, 1966), 181-206. 11. English translation: A Commentary on the Divine Liturgy, trans. J. M. Hussey and P. A. McNulty (Original edition, London, SPCK, 1966, reprinted by St. Vladimir’s Seminary Press, Crestwood, NY, 1997). 12. English translation forthcoming: St. Symeon of Thessalonica: the Liturgical Commentaries (Rome: Pontifical Institute of Mediaeval Studies Publications, 2009). 14. “The Liturgy of the Great Church: An Initial Synthesis of Structure and Interpretation on the Eve of Iconoclasm,” Dumbarton Oaks Papers 34-35 (1980-81), 45-775. 15. Taft, “The Liturgy of the Great Church,” 72. 16. Thomas Talley deals with this from the point of view of the Feast of Pascha; see his “History and Eschatology in the Primitive Pascha,” Worship 47 (1973), 212-21. 17. Taft, “The Liturgy of the Great Church,” 64-65; he quotes Mingana’s translation. 18. Taft, “The Liturgy of the Great Church,” 58. 19. Mystagogia, 198 (all quotations are from Berthold’s translation, cited above). 20. The bishop (celebrant) would have listened to the readings from his synthronon (kathedra) behind the altar (holy table) at the wall of the apse. After the readings he would descend (the chair was up some steps) and go to the holy table for the eucharistic Liturgy, from which the catechumens were excluded (at least theoretically, though by the seventh century there may not have been many). From Liturgical Ministry 19 (Winter 2010) 29–35.